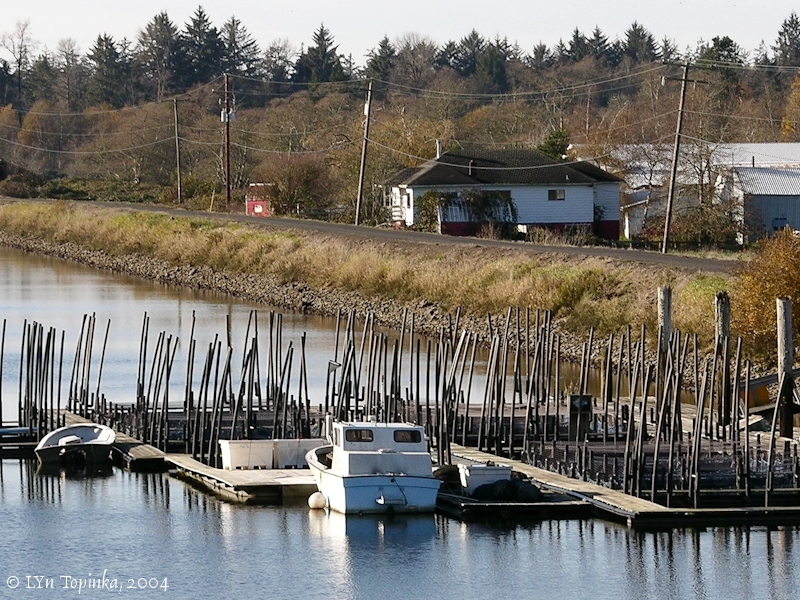 "Net Pens, Washington and Oregon"
Click image to enlarge Net Pens, Blind Slough, Oregon. Image taken November 20, 2004. 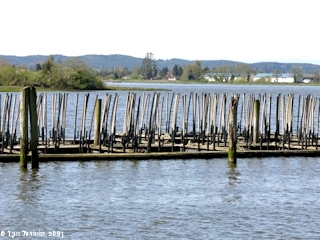 Since 1976 Clatsop County, Oregon, has maintained a project along the Lower Columbia River, with salmon "net pens" first set up in Youngs Bay, and, as the project proved worthwhile, net pens were added in Blind Slough and near Tongue Point. Fingerlings were raised and then released in the Columbia River as smolts. According to Clatsop County's "Fisheries Project" information (2007), in 1977 the project released 50,000 coho. In 2004 the project released 2.4 million coho, 1.5 million spring chinook, and over half a million bright fall chinook smolts. The chinook and coho fingerlings come from Oregon Department of Fish and Wildlife and U.S. Fish and Wildlife hatcheries, plus the Clatsop project receives eggs for incubation at its hatchery on the South Fork of the Klaskanine River. 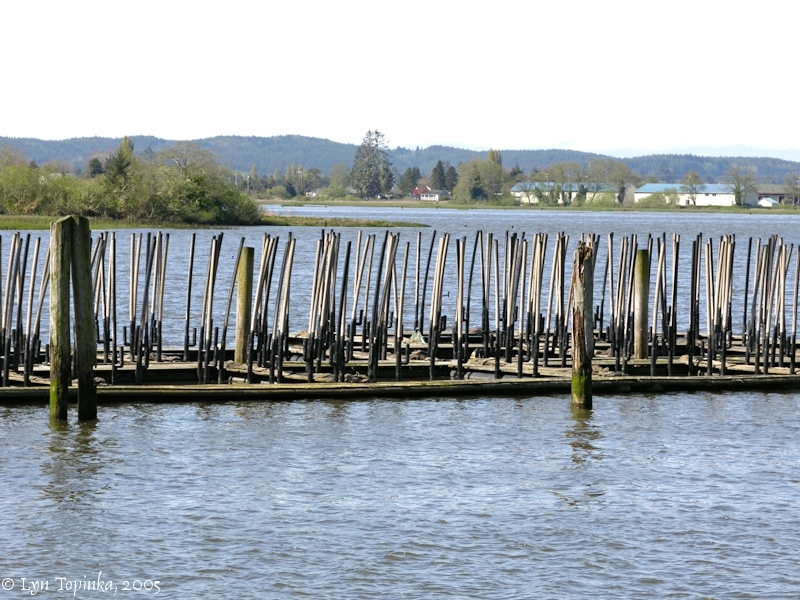 The "net pens" themselves are floating fish pens secured to pilings along the shoreline. 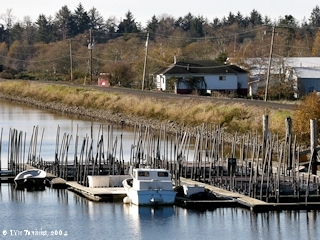 The Clatsop County project is just one of many net pen projects established along the Lower Columbia River, with other projects managed by the Oregon Department of Fish and Wildlife and the Washington Department of Fish and Wildlife, all with sponsorship by the Bonneville Power Administration (BPA). Net Pen sites are located up and down the Lower Columbia River, with locations at (as of 2007) Blind Slough, Youngs Bay, Tongue Point, Deep River (12 pens were installed in 1999 with 16 additional pens being requested in 2006), and Steamboat Slough near Skamokawa. Click image to enlarge View across Youngs Bay from Tide Point. Looking towards entrance to Cook Slough. Fish-rearing pens (net pens) in the foreground. View from Tide Point along east side of Youngs Bay. Image taken April 19, 2005. Great numbers of Swan Geese Brant Ducks & Gulls in this great bend which is Crouded with low Islands covered with weeds grass &c. and overflowed every flood tide [today the Lewis and Clark National Wildlife Refuge] The people of the last village is-[blank] ... We are now decending to see if a favourable place should offer on the So Side to winter &c.
S. 70° W 1 do. to a high point S.